Jump on board of a spacecraft to visit all the corners of our solar system and learn about the planets and other cosmic objects that make up our part of the universe. Find out how the Earth moves through space and imagine what life would be like on Venus or Mars. The tour of the solar system begins on the home screen with the cartoon robot narrators, Jet and Roy, introducing each other. The robots will take you through each of the sections in turn from the sun all the way out to the dwarf planets. There is another option to navigate on your own by accessing the solar system map, which is basically the main menu of the app. By moving the spaceship graphic you can select the section you want to explore. On every section of the app the map is easily returned to be touching the map icon at the top of the screen. There are three main topics covered – the Earth-Sun-moon relationships, the planets of the solar system and other objects in the solar system. Each section will present a cosmic object by displaying satellite photographs, diagrams and simple animations. There is also a body of text to read with some key vocabulary highlighted in red. By touching the word a definition appears. It is simple to navigate in the app using the arrows at the bottom of the screen and you can continue with the next section or return to the previous one. 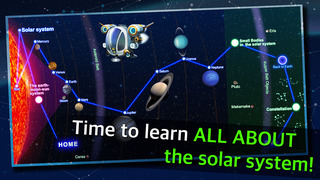 The interactive graphics for the ‘Earth-Sun-moon relationship’ topic are impressive as well as being effective for the learner to grasp some complicated motion concepts. The best of these are for the lunar cycle, changes in tides and both types of eclipses. By moving the objects around the graphics respond by displaying how this affects what we see from Earth. The ‘planets of the solar system’ topic presents about a dozen statistics on each of the planets such as distance from the sun, temperature and surface gravity compared to the Earth’s. The user can also zoom in on the planet and see an image of the surface. The final topic presents other celestial bodies include the dwarf planets, asteroids, meteoroids and comets. Back on the home screen there are additional icons so you can find out more about the developer and adjust the general settings of the app. The standard options of background music, sound effects and language select are available as well as the option of using the app in tutorial mode. The tutorial mode is definitely a useful way of initially getting to grips with moving about the app. 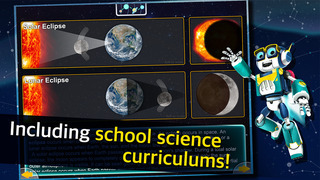 With the level of detailed text and science information this app is best suited for late primary school or early post-primary. However, the cartoon theme and rich graphics will help to engage younger learners. Unfortunately there are no means to assess the learning of the user throughout this educational app. An ‘end of topic’ quiz or a variation of space-themed games could be a nice addition in future versions to gauge the progress of the learner. Most of the graphic point out that they are not to scale and it could also be worth including a scale model to compare sizes of objects or the vast distances between them. Science Education Application reflecting elementary-secondary curriculums faithfully! 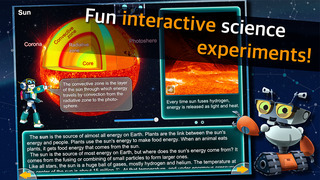 Want to know about but difficult Space science, let’s study pleasantly with ipad from now on! “Why are seasons formed? What about rising tide and ebb tide? Children’s difficult and troublesome questions, do not speak vaguely anymore! More and more knowledge is growing about the Earth and the space before one knows! A mom and a child become an expert of the solar system. 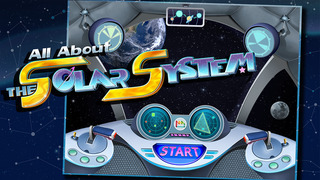 Do prerequisite learning easily with ‘All About the Solar System’. All About the Solar System is!! 1. 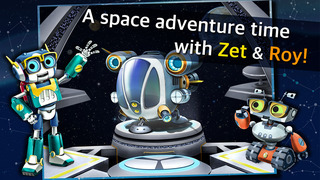 It attracts an interest and concentration of children with the space travel concept going with ‘Roy and Zet, Robot characters. 2 It makes the study easier and more fun by adding various interaction effects and experiment examples. - What are the rotation and the revolution? 4) What are solar eclipse and lunar eclipse? 5) Why do rising tide and ebb tide arise? There are not only the planets in the solar system?! What are the difference among meteoroid, meteor, and meteorite?